Our Senior Minister, Rev Faith Woods, believes in the practical application of Spiritual laws in daily life. Her inner work is practicing the presence of Spirit and seeing the light and truth within each individual. Her work in the world includes encouraging individuals to align with Spirit in their daily life and empowering them to take this teaching out into the world. Rev. Faith Woods began her deep spiritual journey when she discovered Celebration Center for Spiritual Living and the Science of Mind teachings in 1993. After four years of classes, she became a Licensed Practitioner. Following her graduation, from Holmes Institute in 2010, Rev. 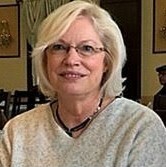 Faith served as Staff Minister, Director of Family Ministries and Assistant Minister at Celebration Center. Eventually striking out on her own, she formed a Study Group in Stafford, Virginia, and concurrently began supporting the Charlottesville Study Group. Rev. Faith began serving a Senior Minister at Celebration Center in October 2016. As a teacher and speaker, she shares her wisdom, humor and positive sense of life. The passion to awaken the joy of life in others begins with a ready smile and an open heart. Her previous vocations as a public school teacher and director of human resources provide a rich background for working with people and inviting individuals to shine their light in the world.